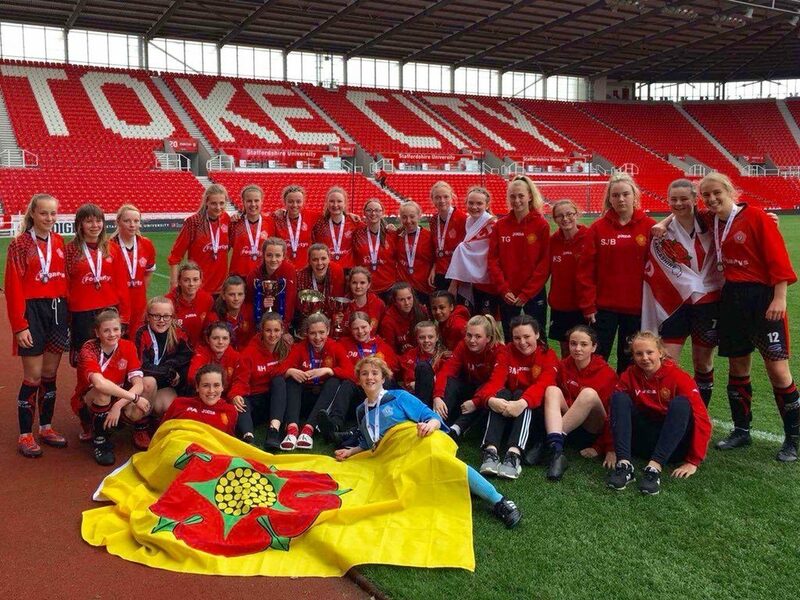 Three years ago Lancashire Schools girls became the first to win both National U-14 and U-16 titles in the same season, this term the Red Rose county have won all four trophies available to them. On 23rd April Lancashire U-14s beat Durham 3-0 to become Northern Counties champions, then on 6th May at Stoke City FC, the achievement was repeated. A goal from captain Alessya Aherne and a hat-trick from Tiggy Gent – who scored in every round of the competition – gave the Red Rose side a 4-0 victory over Kent to take the trophy back to Lancashire for the fifth time. The U-16s then secured the double for the second time as a solitary strike from Mary Collier was sufficient to claim the trophy. One week on the U-16s faced Northumberland at the County Ground in Leyland in their Northern Counties final, attempting to bring home a fourth trophy of the season. An outstanding save from Lucy Williamson kept the visitors at bay before Collier got the opening goal. A keenly fought contest remained in the balance until the final minutes, when Tahnee Lucas added a second goal to complete an incredible season for the Red Rose County as double double winners.